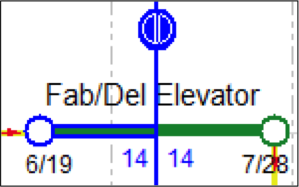 If desired, the Estimated Complete or Calculated Complete can be displayed on the canvas in place of the duration; however, only one can be displayed at a time. Turning any one of them on will automatically turn the others off. When an activity is in-progress, the planned duration will be split into the progressed duration and remaining duration. By default, these will show up to the left and right of the data date line but can be customized manually. Each field can be turned off individually; however, the planned duration will not be able to be displayed while in progress. Likewise, the Estimated Complete and Calculated Complete will be split into progressed completes and remaining completes. However, these can only be turned on and off as a pair. Check the box next to the desired field. NOTE: These fields can also be turned on or off for multiple objects at a time. For more info, see Bulk-Editing Objects.